Made the switch... keyboard question. I just made the switch from my Z10 (which I'm sad to have done but I needed to get more functionality out of my phone) and no way I wasn't sticking with BlackBerry. I have messed around with my Key2 for a couple hours and I'm wondering about the virtual keyboard. Is there a way to set the V board to come up when I long press on a symbol or do you really only get to use it when your going to type something??? If I have the "show virtual keyboard" shut off is there a way I can access the virtual keyboard without keeping it on all the time when I go to type?? WOW that was EASY. THANK YOU VERY MUCH. Do you guys find you use the digital keyboard more then not?? This is my first physical keyboard. I don't think I've ever used the virtual keyboard, aside from symbols. The only valid reason to use a VKB on a KEY phone is to not wake up a sleeping wife, why else type on glass on a VKB that sits too high?? mikeath and Rico4you like this. I just long-press the alt key until the ALT icon is underlined (eg permanent 'alt mode') and then press the alt key again when I'm done. I think it's whatever method you get used to - I do the alt key long-press automatically nowadays without thinking about it (and I hate typing on glass). Thanks for the tip. I will try this method more often. Just tried it while typing this and found it easier thanks. Note my swipe up worked perfectly posting this slowly. Great news re: the 'swipe up' - have you just had one of the recent updates? If so, which one please? Still on the February patch. Only difference I have made to my typing on this phone is to slow down and that includes the swipe up. Double press of the space bar works perfectly each time as does the auto capitalise after a full stop. I have not restarted my phone in a number of days. Just wondering what the three dots are under the middle word suggestion ? Man I love this Forum. We are in a class of our own. LONG LIVE BLACKBERRY. I too would like to know what the three dots are for? 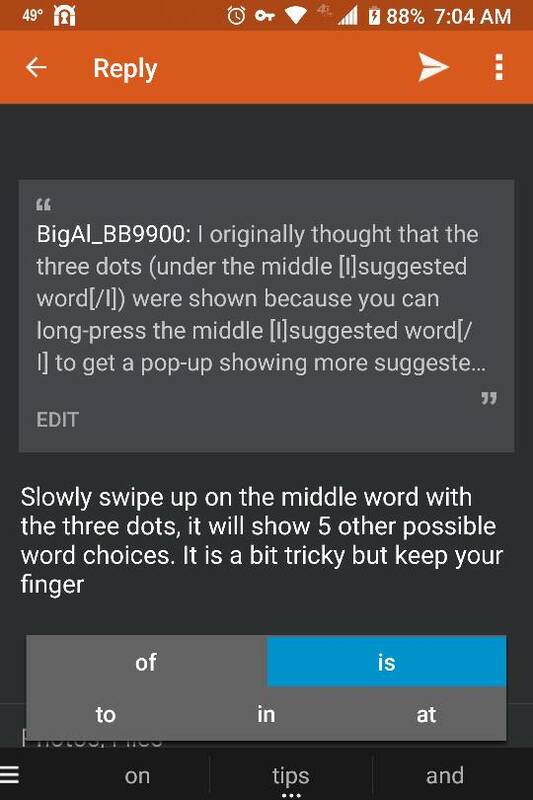 ... then I realised that long-press on ANY of the three suggested words shows the same pop-up. Maybe someone should start a new thread just asking this question and then one of Blackberry/Key2 Gurus can answer this for us? Slowly swipe up on the middle word with the three dots, it will show 5 other possible word choices. Actually it is more like a pull/ push up on the center word. It is a bit tricky but keep your finger on it. See attached screenshot. The reason they only put the 3 dots under the middle word is just a design choice. They could have put the 3 dots under the other words as well but they rightly chose to only put them in the middle. It's true that the extra function also works for the other words which is how it was designed to work. That's true. I only tried it on the center word but the swipe up (as opposed to the swipe-up word replacement feature) does work on the other displayed words as well. The three dots are there to indicate that another function/feature exists. EDIT: I wrote the blurb below, before the two posts above had appeared! .... this happens for all three suggested words for me, not just the middle one (with the dots underneath). Where are you starting your slow 'swipe up' from - on the suggested word (eg on the screen), or somewhere on the keyboard? Yes, that does work as well. Thanks for spotting that. So it can be activated by two methods. Swiping down with 2 fingers also brings up the symbols. You can also reach the numbers from there. Just saying. Yep! That's why I previously said "I think it's whatever method you get used to"
Will there be a Red Key2 for the US market?